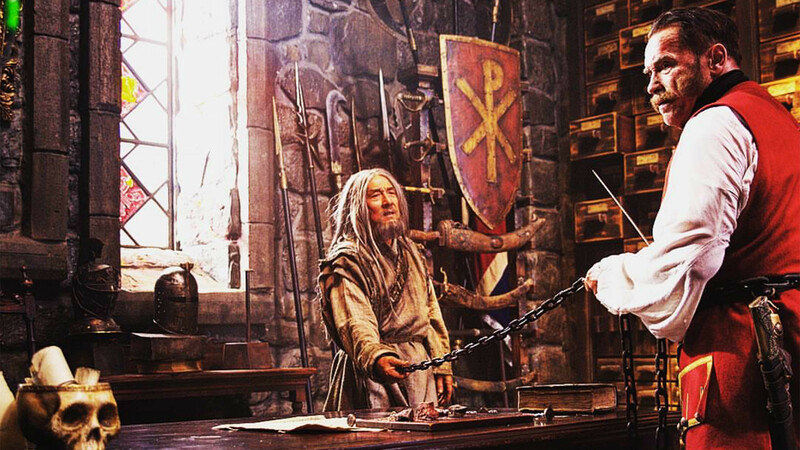 Arnold Schwarzenegger and Jackie Chan in Viy 2 (2018). Hollywood celebrities often appear in Russian movies, in both starring roles and cameos. In any case, they serve as a strong magnet to attract movie-goers. American inventor Douglas McCracken (played by Richard Harris) arrives in the Russian Empire in 1885 to promote his invention known as the “Barber of Siberia” – huge machine for harvesting the forest. His assistant Jane Callahan (played by Julia Ormond) helps him to secure the patronage of Russian officials. Jane accidentally falls in love with the young cadet Andrei Tolstoy, which has tragic consequences for both of them. In this road movie Michael Madsen plays an episodic role of American agent of Mila, a Russia-born Hollywood star who returns to her homeland to shoot a movie, but gets into many troubles. The martial arts master plays a cameo in this Russian comedy, which shows events of the 1812 war between the Russian Empire and Napoleonic France in an extremely farcical way. In the 18th century, during a long journey, British cartographer Jonathan Green (played by Jason Flemying) arrives in an isolated rural village hidden beyond the Carpathian Mountains. Here, he is forced to face and resist ancient demons from Slavic mythology. The adventures of Jonathan Green continue, and this time he is ordered by Russian Tsar Peter the Great to make maps of the Far East. Green arrives in China, where he must again do battle with the supernatural. This Sino-Russian blockbuster got a top cast when Jackie Chan and Arnold Schwarzenegger joined the project. No details of the plot have been revealed. Still, it’s known that Arnold plays a guard at the Tower of London who likes to stage martial arts fights between his prisoners. According to the producers, the audience can expect to see a fight between him and the character played by Jackie Chan. Thomas Kretschmann has already starred in one Stalingrad – the German cult movie of 1993 – as Lieutenant Hans von Witzland. In the Russian movie Kretschmann plays the role of Hauptmann Peter Khan, whose troops try to remove a dozen Soviet soldiers from a house they are desperately defending. Muscovite girl Nadya, played by Milla Jovovich, finds herself in a love triangle where she is forced to choose between the prosperous, decisive Danya and the kind, modest (and more lovable) Slava. Interestingly, in the film Jovovich speaks Russian without being dubbed. She has an accent because Nadya has lived for a long time in London before returning to Moscow. This movie is an almanac consisting of five stories connected by the theme of love. The hero of one of the stories, John Malkovich, portrays an expert in the psychology of relationships who himself faces huge complicated problems in his own family. Lyosha is a typical loser who has no job, money or girlfriend. But everything changes when he finds the lost dog of a laptop repair shop owner, portrayed by Snoop Dogg. In return, he presents Lyosha a magical laptop. Typing a wish in the status update box in the Odnoklassniki social network makes it come true. Now things are looking up for Lyosha. The famous Shang Tsung from Mortal Kombat, Tagawa plays Father Nikolai, a priest of the Japanese Orthodox Church, who has fallen into conflict with Yakudza. To avoid problems, Father Nikolai is sent to Russia, to a distant rural village. There he faces the harsh conditions of rural Russia, hostile people and threats from local bandits. As for Cary-Hiroyuki Tagawa, he was baptized as Panteleymon in the Russian Orthodox Church in 2015. Here, you can find out what roles (besides “bad guys”) Russian actors play in Hollywood movies.